I want to be an optimist for 2014 but it is hard to think that way when you look at the facts of the current US economy. There are positive signs in the current economic environment, but how much of this is truth or just the desire to feel better as we start the year. To provide context for 2014, we have to start with the major theme that is overhanging the global economy, deleveraging. We were and are still in a balance sheet recession adjustment process. The data that we have on balance sheet recessions is that it may take more than five years to fix the system. A balance sheet recession needs to work through the excesses in the economy. We are doing it at a rate that is consistent with history. We may not like this but it is reality. We have followed a growth path of around 2.3% since the beginning of the recovery. We are below the long-term growth path and continue to have a large output gap. This is unlikely to be closed in 2014. Global GDP has been revised down by the IMF to 2.9% in 2013 and 3.6% in 2014. This is not a launch pad for a stronger recovery. The labor markets are not in good shape and household income is 9.1% below the highs set in 1999 and still over 8% below pre-recession levels. People are not in better income shape, so the driver of consumer spending is not present. Yes, balance sheets have improved, but this is through belt tightening, lower rates, and bankruptcies which wipeout debt. Interest rates are being kept low, but there is a fiscal drag in the US economy. The deficit has moved from over $1 trillion to a level that will be closer to just under $700 billion. Fed employment is declining. State and local job growth is still below past highs. It does not seem likely that we will get any fiscal help over the next year. Regulation uncertainty will provide a drag on growth. The forward guidance from the Fed is that rates will be kept low even if we move through the 6.5% unemployment rate. We will see low rates even if we go to 6% unemployment, but that does not mean that monetary policy will help with job creation. Inflation is below the 2% target for the Fed. The benchmark PCE is at 1.2% and does not show signs of moving higher in the near-term. Labor cost are low, commodity prices are low, and firms have little pricing power in this economy. The Fed wants inflation but has been unable to create it. The stock market does not seem to have the environment necessary for significant increases in 2014. Profits for the third quarter are above 9.5% but revenue ha sonly increased by 2.7% YOY. Net income is at the high end of ranges at 14.9% but sales are only increasing 5% YOY. This means that gains are coming from cost containment and lower interest expenses. This cannot continue forever. The gains in stocks are coming form jumps in the P/E ration not earnings. Risk is at low levels as measure by the VIXX index, but given the level of uncertainty in the markets, it is unclear that this also can continue. This is gloomy but it is the reality of what we are dealing with. We can have some good news that will create optimism in markets, but we want to be more careful concerning any view of growth opportunities. A very insightful article from Gillian Tett in the FT on unconventional wisdom since the financial crisis. I will not present all of the arguments but will say that it is a good road map on what are the key take-aways from the Great Recession. 1. Bigger in banking is not better. We do not need institutions that are too big to fail. 2. Finance is self-stabilizing. Yes, and speculators will always drive markets to equilibrium. 5. Liquidity matters. You never have it when you need it. 6. Bubbles must be popped early. Yes, bubbles do exist. 7. Structural solutions are not taboo. But that does not mean we will get it right. 8. Shadows should not stay shadowy. There are shadows because markets will try and avoid regulation. So now we have this information, but that does not mean we will know how to use it. There is a growing consensus that the US and the world needs more stimulus for longer. Certainly, this should not be surprising given the size of the output gap that has not been closed almost five years since the bottom of the recession. This is also not surprising given the forecasts provided by those who have looked at past balance sheet recessions. Forget about tapering, the view from the leading monetary economists is that we have to keep real rates even lower for more years to solve the great potential growth gap. The new theme in macroeconomics going back in time to the work of Alvin Hansen is secular stagnation and the Larry Summers is at the vanguard for stating that more has to be done. The action which is being called for by Summers is a combination of more classic Keynesian economics. Fiscal policy will be more effective at low interest rates, and monetary policy is needed to keep real rates negative. what is startling about the Summers proposal is that it is very clear on the impact for savers - they should be penalized. Rates should be held down in a manner that would be consistent with the Keynesian view of "euthanizing the rentier class". The only way to close the output gap is make money as cheap as possible to push activity forward. Additionally, Summers is willing to accept the risk of a bubbles as simple cost to get the output gap closed. How can we obtain a wealth effect if there will be maker bubbles that will burst. I am not sure how this is going to help investment and savings if we accept bubble risk and drive down real rates to unacceptable levels. This is truly unchartered territory that could spell disaster for those who are savers but do not have the skill or funds to adapt to this risky environment. Morgan Stanley will sell its oil merchanting unit to Russia's Rosneft. Rosneft is the largest oil company in Russia, but is not an independent company in the traditional sense, but one that works for the interests of the Russian state. It would be hard pressed to say that it would make corporate decisions that were in conflict with state policy. This sale is interesting for two reasons. First, it shows the growing commitment of Wall Street firms to get out of the commodity business. Usually a good sign that we are getting close to the commodity bottom when profit maximizing businesses are throwing in the towel. Clearly, the commodity business has not been generating the returns demanded by share-holders. Second, it is interesting that the sale is to a foreign company that is tied closely to the government. This places key logistical assets and information in the hands of a company that may not be profit-maximizing and that may have goals that are conflict with the US. In fact, it could be argued that this sale will reduce the level of competition in the markets and could lead to actions that will place a squeeze on prices at key market choke points. Given all of the actions taken by the CFTC to increase market transparency and competition, it is not clear that this sale will be in the bets interests of the market. It is an alarming trend to see more commodity assets in the hands of state owned companies. Is someone watching the competitive store? What is going on in Chinese financial markets? SHIBOR 1 month rates are at the highest levels since June, 7.65%. It seems odd that we would have huge seasonal swings in interest rates at the end of the quarter and end of the year for a sophisticated financial system, yet here we are with the PBOC pumping money into the banking system to stave off a funding crisis for smaller financial institutions as they search for funds to meet end of year rate requirements. We have to go back to the real bills doctrine and say clearly that the central bank has to meet the needs of the financial system even if they want to tighten bank standards. It does not matter that there are significant excess reserves. The money is not getting to those who need it. We know that the PBOC wants to form a more market determined rate environment, but the funding inside China is lopsided toward the large state owned institutions. Once a crisis begins, it may be hard to stop, and it will have credibility issues across global financial markets. If China wants to show that it can be major financial player, the central bank has to take care of its house. EU downgrade - who will be left at AAA? S&P has downgraded the EU to AA+ from AAA. The EU does not have much debt outstanding, but it is hard to think of an organization that is dependent on 28 countries most of who do not have AAA ratings as AAA-rated. You cannot make the EU as a entity issuing debt more creditworthy than the back stop provided by member countries. This should have happened during the sovereign crisis, so no one should argue that S&P made a wrong call. The only argument is that S&P should have done this two years ago. We are running out of AAA-rated countries. Of course, the world may not change dramatically if we do not have any AAA-rated. The "safe" assets will be the ones most highly rated. The US has not suffered from downgrade. The same may apply to the EU. Ricardo Reis has written a well organized paper on central bank design in the Fall 2013 Journal of Economic Perspectives. I will outline some of the key features because it provides a good framework for any analyst of central bank policy. When thinking about central bank policy, walk through these dimensions. The goals of central bank policy should be the driver of any action or policy choice. Dimension 1: The strictness of the central bank's mandate - Is it just inflation or doe sit include a dual mandate? The Fed seism to be in transition with a growing emphasis on full employment and systemic risks. Dimension 2: The choice of long-run goals - So what is full employment and potential GDP? What is the inflation goal in the long-run? Dimension 4: The choice of central bankers - The move at the Fed is to have more academics and viewer true bankers. This will have an impact on goals. Dimension 5: The role of the central bank as a source of revenue - This speaks to the relationship with the Treasury department and central bank independence. Dimension 6: The importance of fiscal backing for the central bank - Again what is the role of the fiscal government with respect to monetary policy? Dimension 7: The set of asset held by the central bank - Should it include just Treasury instruments but other types of assets? Dimension 8: The payment of interest on reserves - This will determine how the central bank is integrated with other banks with respect to reserve lending. Dimension 9: The importance of announcements and commitments - What is the level of credibility and how are announcements made to the market? Dimension 10: Choosing the extent of transparency - How much transparency does the central bank want to have? Dimension 11: Picking the channel(s) of communication - It can be through minutes, speeches, or actions. The choice will have a significant impact on rates. Dimension 12: The accountability of the central bank - Who holds the central bank accountable? Call it the twelve questions, but this is very comprehensive review of the key issues of any central bank. The Fed has made its move and has cut the bond purchase plan by $10 billion a month. The program may end by December 2014. So what does this mean? I don't think any one really knows. So we have a cut of $10 billion but the central bank still buys $75 billion. How does this matter relative to what foreign central banks, hedge funds, and dealers may do? A gradual change in QE is the only reasonable option for the Fed. A step function makes sense in order to have the market adjust to the change in policy; however, we are not sure when the cuts will start to have a bite on investors. Cutting the balance sheet of the Fed should at some point start to have an impact on excess reserves and rates, but whether at $75 or $25 billion is just a guess. Investors will look for other information to answer the question on rates, and the answer is forward guidance. The forward guidance is that low rates will continue for much longer that the QE. So how is this going to work? The quantity side will change, but trust us the rates will stay low for much lower. What will be the mechanism for policy? This will be a threat to Fed creditability. It is not clear how policy will work. It is surprising that policies within a single government may clash, or at least that is what you should expect. The left hand should know what the right is doing. Unfortunately, that may not be the case with central banks. Perhaps this is a good reason why central banks should have only one policy directive. The Fed is following a zero interest rate policy (ZIRP) in an effort to increase aggregate demand. In fact, the policy is actually to force real rates negative. Simple enough. But if investors deposit money in a bank, the bank has to pay for deposit insurance which could be between 5-7 bps. This means that it could actually cost banks money to have new deposits. Think about this, you offer the depositor a rate and then lend out the money at a slightly higher rate which will allow you to gain the spread. But the spread will have to cover the deposit insurance so that you will have to offer money at a higher positive spread. If you do not have good lending opportunities, you could actually lose money on new deposits. Deposit insurance is not free, but regulation can impede the ability of banks to lower rates and still make a profit. Regulation on bank capital, which is needed, can also impede lending and hurt aggregate demand. So what are the right policies? It is more than forward guidance. 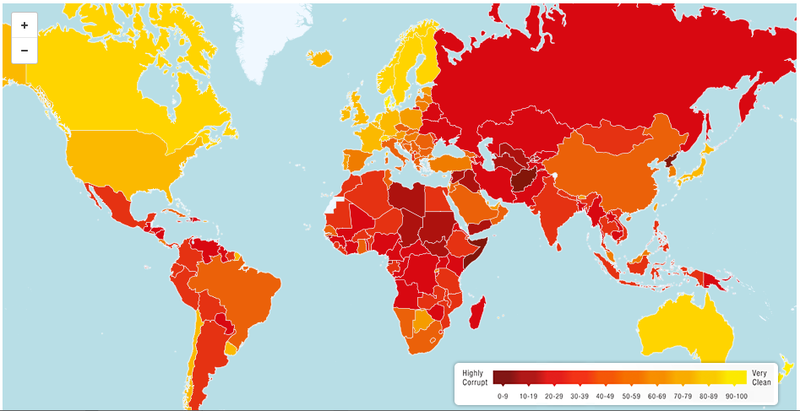 The corruption index for 2013 does not tell a very pretty picture especially when you look at emerging market countries. This has important implications for international finance and the movement of money. There is an ongoing issue of why there are capital flows moving from South to North. Capital should be flowing from developed countries; however, if there is ongoing corruption such that many view that funds are not safe, there will still be movement to developed markets even if returns are lower. If corruption is lowered around the world, capital will flow more freely to countries that actually need it. 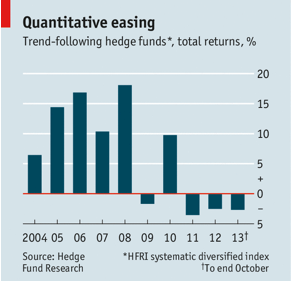 The Economist had an article on trend-following managed futures managers which was not very appealing. The thesis is simple, the poor performance one the last three years is a direct result of the markets being controlled by central banks and politicians who want calmness. With markets in hibernation, there are no trends to exploit. Hence, no returns. If you look at the volatility of the major asset classes, you will not find any dispute to this fact. Commodity volatility is near 10 year lows. Bond volatility had spike during the "taper talk" but is not down to low levels. Stock volatility is low as measured by the VIXX index. Foreign exchange volatility is also low. If you are a trend-follower, you need market moves. If no market moves or range, it is hard to make a profit and run big portfolios. Traders will have to move to shorter horizons for trading when volatility is lower, but it is much harder to make money consistently with fast reading. That is especially true if the strategy has a lot of money to invest. The next question is who or what is causing the low volatility. Well, if central banks are flooding the market with liquidity to keep short rates low and stable, there will not be a lot of volatility in the markets. The discount factor for any market that is driven by a present value calculation will have lower volatility. This is especially true of the most active futures markets. So, when will trend-following make some money? My guess is that 2014 will be a better year given the choice of opportunities. If there is more growth, there will be some good opportunities to gain from the short side of bond trading. If there is a failure of growth, we will see another strong bond rally as the talk of taper is cut. A similar bipolar story will apply to foreign exchange and stock indices. It is easy to say that trend-followers can make money in either up or down markets; however, there is more likelihood markets being on a cusp with respect to growth. I like the work of Gary Klein because it tries to understand the simple problem of how individuals in difficult situations make good decisions. There is no time for optimization or decision trees. There is no time for carefully reasoning of all scenarios with what-if analysis. Decisions have to be made and made quickly. This is the life of a trader, a fireman, or a military officer. The simple graph above is the focus of the work in this book. Everyone wants performance improvement and there are two ways to get it. You can decrease errors or you can increase insights. 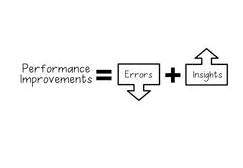 Most of the work on decision-making is focused on decreasing errors. 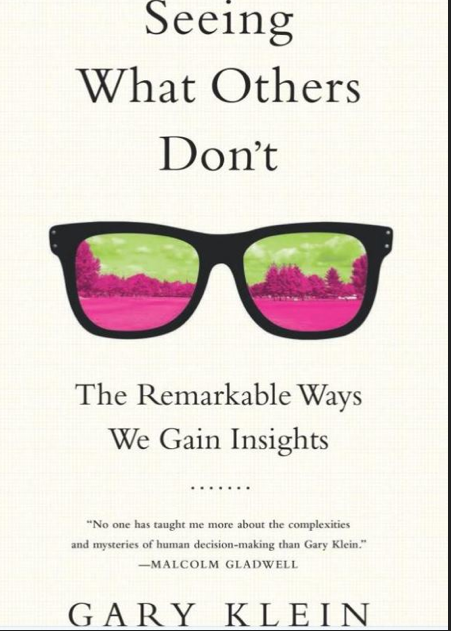 There is less work and research on how to increase insights which is where Gary has focused his attention. The emphasis on decision-making is more focused not on mechanistic forms of error reduction but trying to find insights. 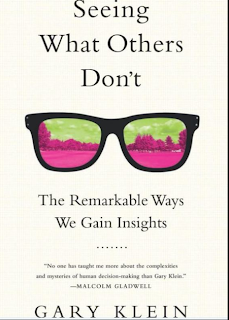 Klein provides some very good examples, stories, and theories but it is not easy to form better insights. He focuses on some the basics which can provide insights. What are the underlying assumptions used to make the decision. Faulty assumptions will lead to poor conclusions. A variation of the garbage in and garbage out. Just as important is understanding the knowledge needed or used in a decision, the beliefs that reprints the foundation of a decision, priorities of the decision-maker, and constants associated with a decision. We cannot be mind-readers. We have to make connections. See contradictions that exist in our views and discard flawed beliefs. Klein believes that we can gain insights through practice and experience. There is a framework that can help with this process. 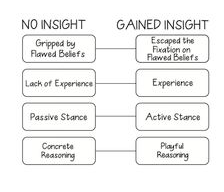 We have to work our insight muscles. OPECis changing. Not because of the direct failure of the cartel but because of changes in the structure of the oil market. Significant changes in both supply and demand will mean that it will more difficult for OPEC to control price. This will lead to the breakdown if there is not an adjustment in behavior. 1. Declining demand from the US. 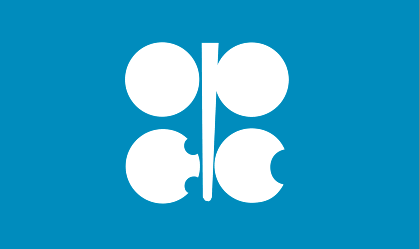 The US will not be energy independent but strong production in oil and natural gas means here is more supply available to the global market from OPEC countries. The oil has to be sold somewhere and likely at a lower price. 2. New supply form Iran and Iraq. If there is some negotiated settlement conceding nuclear power and Iran this will open up production to the global market. There is still IRan supply hitting the markets but a defreezing of the trade restrictions will cause a jump in supply. Iraq will also be a bigger producer in the next few years. It needs huge sums of money to rebuild the country. Hence, there is a willing seller. 3. Asian demand change. The Asian demand is offsetting some of the decline from the US, but there is a wholesale change in OPEC selling from West to East. This has already begun but will continue to be the key logistic issue in the global market. 4. The Saudi's need for funds. There is a significant need for funds to meet budget demands. A cut in production is good for price but may still have a negative impact on revenue. The world is changing quickly in the global oil market and some players may not be ready for this change. This is short book of four lectures given at George Washington University. There are no real surprises here as we come to the end of the Bernanke period. 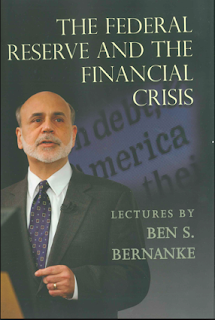 He provides a good historical context of Fed behavior and what was tried to solve the Financial Crisis. Summed up, the Bernanke doctrine from these lectures is very simple, the US economy was not going to turn into a second Great Depression on his watch. As an economist with a strong study of the Great Depression, he had a clear view that the Depression was worse because the Fed did not prove enough liquidity. When in doubt, provide cheap liquidity - as much as possibly needed. 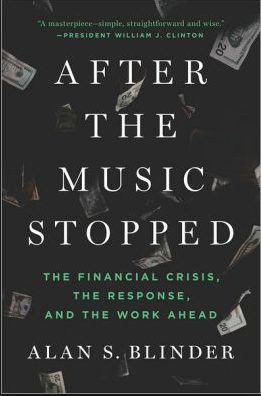 Alan Blinder's After the Music Stopped - The Financial Crisis, the Response, and the Work Ahead is the best work on the Financial Crisis that I have read. If you have to read one single book on the topic, this is the one. I have closely followed the academic and policy work on the Financial Crisis and this book is very well-written, well researched, and pitched at a level that can be ready by most business people. If there is any academic jargon, Blinder covers the issue with side notes. He does a good job of not just reporting the fact, but also provides context with economic theory and his personal views. He also provides even-handed recommendations for solving crises and also provides a good review of the policy changes that have been implemented. His argument is that this did not have to happen. Policy mistakes years prior as well as mistakes done in real time made for a bad situation. Still, he is not being a Monday morning quarterback. He provides details on why some decisions were very effective and saved the financial system. After reading this boo, you will feel as though we need Alan Blinder to provide more policy advice to the government. The latest issue of Forbes provides a number of good quotes on investment advice. Here are some of the best. The four most dangerous words in investing are "this time is different." Speculation is neither illegal, immoral nor (for most people) fattening to the pocketbook. Never invest in any idea you can't illustrate with crayon. Know what you own and know why you own it. Go for a business that any idiot can run - because sooner or later, any idiot is probably going to run it. Time is your friend. Impulse is your enemy. Risk comes form not knowing what you are doing. What is smart at one price is dumb at another. The risks of being out of the game are huge compared with to the risk of being in it. Big opportunities come infrequently. When it's raining gold, reach for a bucket, not a thimble. Rule number one: Most things will prove to be cyclical. Rule number two: some of the greatest opportuntities for gain or loss come when other people forget rule number one. When you feel like bragging, it's probably time to sell. Buy on the canons and sell on the trumpets. Never confuse investing with trading. Never buy anything form someone who is out of breath. The time to buy is when there's blood on the streets. 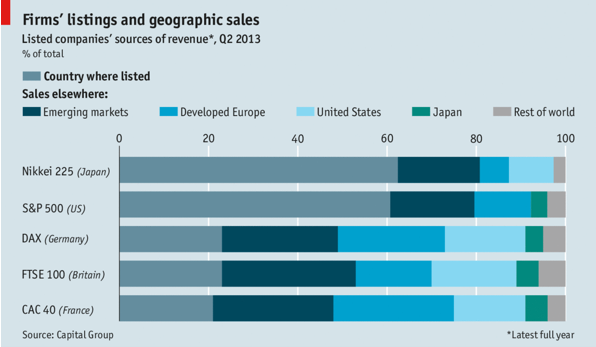 The Economist will present some dry tables and graphs each week, but this is one that jumped out at me. If you look closely at the three European stock markets you will notice how little sales comes from the local country. If you add developed Europe you will get something closer to the US and Japan but still not the same percentages. These stocks are driven by global growth especially emerging markets. The lag of the EU markets relate to the US is twofold. First, growth in the EU has been slower with it just coming out of a recession, but as important, these markets are driven by the growth in EM which has been slowing. The EM markets have been a drag on global stocks markets. If we see more improvement in EM growth next year, we should see more improvement in EU stocks versus the US. The link between sales growth, earnings, and stock valuation is not always close but it is still a primary factor for any valuation analysis. 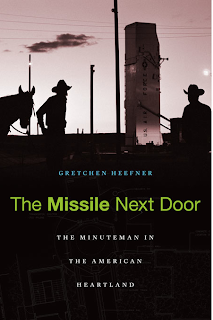 The Missile Next Door is an interesting book on the development of the MinuteMan missile system that dotted the Great Plains with nuclear tipped missile all pointed at the Soviet Union. The theory behind the missile build-up was simple. The US Air Force would place thousands of cheap ICBM missile in hardened silos around the mostly deserted plains in order to provide enough nuclear firepower to destroy our enemy even if we did not strike first. This project developed swiftly in the early '60's and was a massive construction project that changed the face of the country without much discussion. The people of the US knew this was happening but seemed unable to grasp the magnitude of this project beyond the fact that it created local jobs and was supposed to save the country in case of a nuclear attack. Could this happen in today? Hard to say, but with lowing information voters anything is possible. It sends chills to anyone who reads this book how easily a democracy can follow policies that can have global ramifications without too much discussion. I am not a fan of how the work was presented by the author. It could have been more tightly focused on the key issues of how this got developed and changed the lives of locals, but it is an important part of our Cold War history that needs to be understood. Jean Ziegler presents a sad book on our inability to feed the world. He is made about all of the talk and no action. It is a sobering book to read around Thanksgiving. Over one billion people are either starving or suffering from malnutrition. Some famine may be associated with the randomness of weather and harvests but most can be prevented. Most is a result of man-made decisions, poor government policies, genocide, and exploitation by companies. Free trade unfettered can destroy local food production. Companies try to cut costs and sell more product. All can have the almost unintended consequence of changing the food distribution patterns. Policies like ethanol production substitute food in stomach with fuel in tanks. Subsidies for US and EU farmers make for cheap exports. Control by a limited number of agribusinesses can cause high prices. Government restricts food movements. The IMF and World Bank often follow macroeconomic policies that hurt local food distribution. 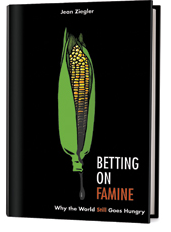 Ziegler also argues that speculators contribute to the climate of famine. His case is not strong, but he presents enough evidence to tell all of us that more can be down to improve the logistics of agricultural production. 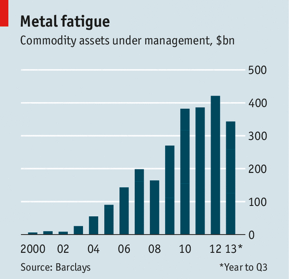 The demand fro commodities as an investment alternative has fallen significantly in 2013. It seems like this will be the worst absolute decline since number shave been tracked and may be the worst in percentage terms as well. Certainly the poor returns have a lot to do with this decline. Money has moved out of the those asset classes which have declined in exchange for increases in equity exposures which have taken on bubble proportions. Global growth and low inflation expectations have also caused a decline in commodity demand; however, this direction can change quickly. Look at the strong gains in 2009 and 2010. While global growth prospects have been quite wide, private forecasters are thinking there will be stronger growth in 2014 in the G3 as well as OECD countries. This could be the driver of a change in commodity demand.